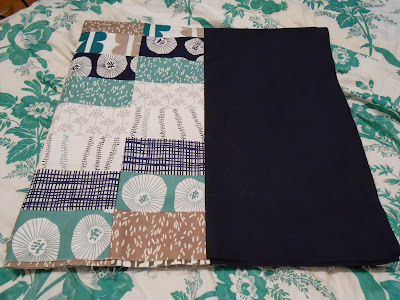 Aquamareen Crafting: TGIFF - People Without Blogs Have Finishes, Too! Last week, on the night before my final day at my internship - I already miss my colleagues! -, I got a wonderful and uplifting email. Sandra from Queensland, Australia, shared a quilt she made for her son's birthday being inspired by my Yoshi journey and mosaic tiles around the web. I'm happy to say, though absolutely in no way surprised, that it was a huge success. Sandra doesn't have a blog but I think she deserves a big cheer for all her hard work so I simply had to share it here and at TGIFF. Don't you just love that scrap-busting multicoloured binding? I wish I had thought of that instead of going down the safe route. Sandra made a surprise back egg as well choosing her son's favourite lime green and she made the whole quilt bigger finishing at 80'' x 100''. I think it turned out fantastic and am reminded that one day I really need to up my quilting ante. Well, on top, I can also share a finish, if only a top finish. Here is the Echo anniversary quilt top all assembled with added strips in Klona dark navy currently measuring 98'' square. At the moment the strips start just at the sides. Let's see how much the quilt will shrink after quilting and washing. I couldn't be bothered with pre-treating this time because I actually wanted to go for a crinkly look and it might just come back to bite me now. Sigh. As planned from the outset I'm going to keep the quilting of the Echo body simple with horizontal and vertical lines (see?) but have decided this afternoon to add a personal touch and more dense quilting to the side strips. If I don't change the plan again until the batting arrives. You can never be sure. Either way, I'm very happy how this is turning out. 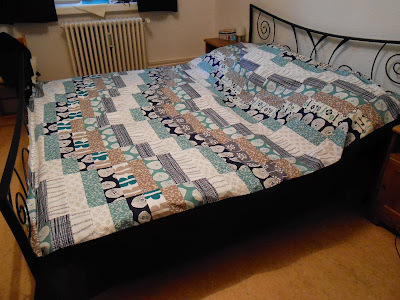 See how perfectly it fits my favourite bed linen? I might even keep my deadline (fingers crossed the batting arrives in time!). Is it really only another week until our first wedding anniversary and sixth altogether? Link party's being hosted by Amy this time. Hop on over! That yoshi quilt is fantastic! And your echo quilt is looking so nice! What kind of quilting are you planning? 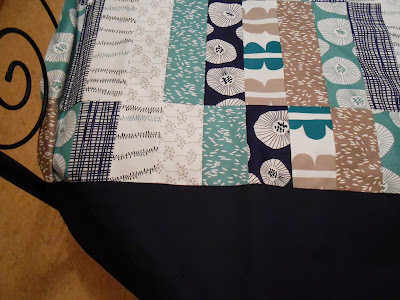 I love both quilts and the colors! Nice finishes! That Yoshi quilt is absolutely amazing -- I love the pieced background!